Olympus has teamed up with with premium bag manufacturer Manfrotto to offer a new ‘Explorer’ messenger bag perfectly fitting to their compact and lightweight OM-D camera system. The new Olympus Explorer bag designed by Manfrotto will be available from late November 2018 at a recommended retail price of 149 EUR. London, 29. October 2018 – To develop a high-quality photography messenger bag perfectly fitting to the compact and lightweight OM-D system, Olympus collaborated with Italian premium bag manufacturer Manfrotto: The result is ‘Explorer’, a customised version of Manfrotto’s stylish ‘Windsor’ messenger bag, which features water repellent coating and a detachable protective camera & lens pouch with configurable internal dividers featuring Manfrotto Protection System. The bag is designed to take any OM-D (or Olympus PEN) camera body and up to three lenses plus a 14” laptop – allowing to travel in comfort while still having all necessary equipment for a small trip or an outdoor photo assignment within easy reach. A tripod can be attached to the bottom of the bag using provided straps. The Olympus Explorer bag designed by Manfrotto will be available from late November 2018 at a recommended retail price of £139.99. 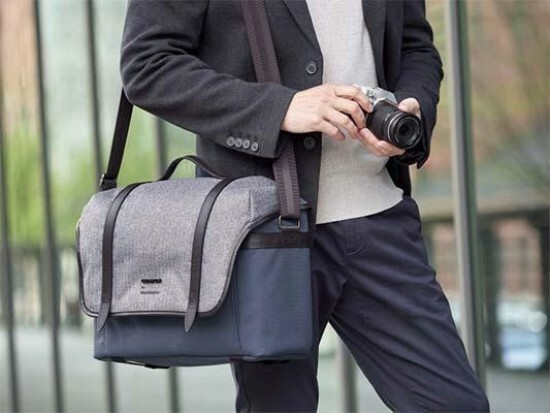 Result of a joint effort by Olympus and premium bag manufacturer Manfrotto, the new Olympus Explorer messenger bag was designed to protect one compact system camera body and up to three lenses while still looking stylishly enough to be the perfect everyday bag. On top of a protective detachable camera/lens pouch and configurable padded dividers to hold and secure all photo equipment in the special protection areas at the heart of the bag, it features a safe compartment for a 14” laptop. All personal items may be safely stored in the inside and outside zippered pockets. Using the provided straps, a tripod can be attached to the bottom of the bag. The Olympus Explorer bag features premium water-repellent fabric, genuine leather trim and a tartan pattern lining in the interior. It is closed with velcro silencer and a buckle for extra security. The camera bag may be attached to a luggage trolley via a zipper solution on the back. A big handle is placed on top preventing the bag from tilting forward when lifting it up. The adjustable shoulder strap and the shoulder pad provide additional comfort. For additional information on Olympus photography accessory range, visit www.olympus.co.uk/accessories. Follow Olympus on Facebook at www.facebook.com/olympusuk and Instagram at @olympusuk. Product specifications are subject to change without notice. Please check the Olympus website at www.olympus.co.uk/accessories for the latest specifications.